2009 Capitol Region Council of Governments (CRCOG) Orthophotography is very high resolution, color, leaf off, aerial photography that covers the entire Capitol Region and the Town of Plainville, Connecticut. The coverage area includes the following municipalities in Connecticut - Andover, Avon, Bloomfield, Bolton, Canton, East Granby, East Hartford, East Windsor, Ellington, Enfield, Farmington, Glastonbury, Granby, Hartford, Hebron, Manchester, Marlborough, Newington, Plainville, Rocky Hill, Simsbury, Somers, South Windsor, Suffield, Tolland, Vernon, West Hartford, Wethersfield, Windsor, and Windsor Locks. The ground resolution is 3 inches (0.25 ft) per image pixel. The orthophotography is intended to support mapping at 1:1,200 scale (1 inch = 100 feet). 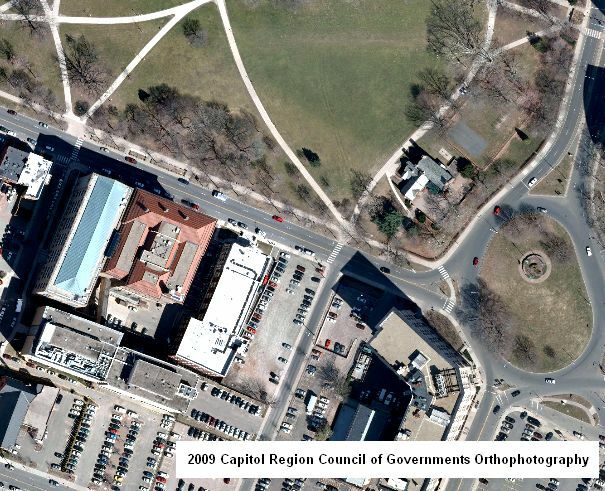 In 2008, the Capitol Region Council of Governments received approval for a Regional Performance Initiative (RPI) grant from the Connecticut Office of Policy and Management to acquire orthophotography. The RPI grants are designed to take advantage of economies of scale that can be realized by regional cooperation and coordination of projects in Connecticut. 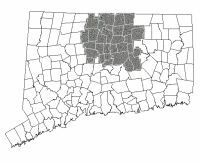 The RPI grant funded the aquisition of 2009 orthophotogy for the entire Capitol Region and the Town of Plainville, for a total of 30 municipalities. Several additional municipalities also contracted with the vendor to acquire orthophotography at reduced cost due to the size and coordination of the flight. The project was managed by CRCOG, with generous assistance from municipal GIS professionals in the region. In particular, the task of reviewing the quality of the orthophotography produced by the vendor was completed by CRCOG staff and these municipal GIS professionals. This particular aerial survey of color, leaf off, 3 inch pixel resolution orthophotography provides the ability to map a comprehensive set of detailed planimetric data that includes roads, sidewalks, streets, highways, and alleys including curb lines, edge of paved surfaces or edge of traveled way, utility poles, street signs, highway lane and traffic safety markings, and general feature details as building footprints, decks, pools, reservoirs, tanks, docks, piers, airports, bridges, overpasses, underpasses, railroads, parking lots, driveways, other impervious surfaces, streams, lakes, drainage courses, holding basins, shorelines, other watercourses, vegetation outlines, fence lines, drainage, and other similar construction or terrain features. This is ideal for identifying features on the ground surface in developed, open, and even wooded areas because leaves on trees and shrubs that normally obstruct the view from above are largely absent. For example, features such as stone walls, dirt roads, and other structures in wooded areas are usually visible and identifiable. Areas of deciduous verses coniferous trees are apparent. The location and shape of features in other GIS data may not exactly match information shown in the 2009 aerial photography primarily due to differences in spatial accuracy and data collection dates. For example, a stream in the 1:24,000-scale Connecticut Hydrography data from CT DEP may not line up exactly with the watercourse shown in this 2009 aerial photography. Waterbody shorelines defined in hydrography GIS data were compiled from information depicted on older 1:24,000-scale USGS topographic quadrangle maps and lack the spatial accuracy and currency of the the waterbodies depicted in this more recent aerial photography. Status - Covers Andover, Avon, Bloomfield, Bolton, Canton, East Granby, East Hartford, East Windsor, Ellington, Enfield, Farmington, Glastonbury, Granby, Hartford, Hebron, Manchester, Marlborough, Newington, Plainville, Rocky Hill, Simsbury, Somers, South Windsor, Suffield, Tolland, Vernon, West Hartford, Wethersfield, Windsor, and Windsor Locks, Connecticut. Date of Data - Spring 2009. Map Scale and Accuracy - The orthophotography is intended to support mapping at 1:1,200 scale (1 inch = 100 feet). The ground resolution is 3 inches (0.25 ft) per image pixel. GIS Metadata - Contains technical documentation describing the 2009 Capitol Region Council of Governments Orthophotography data and the data sources, process steps, and standards used to collect and store this information in a geographic information system (GIS). 2009 Capitol Region Council of Governments Orthophotography is available as a statewide mosaic in File Geodatabase format from DEEP GIS Data. Connect GIS and AutoCAD software to this information online using the Ortho 2009 CRCOG Color CT ECO Map Service.